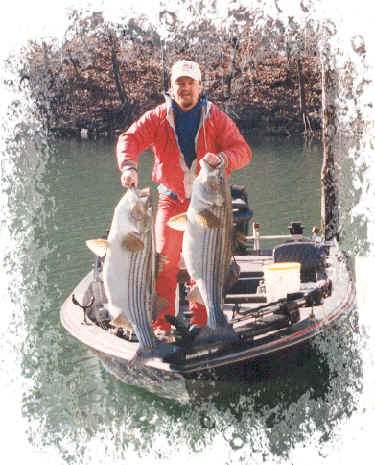 We here at Striper Specialty Guide Service combine for over 40 years of experience on stripers & hybrids. We spend countless hours on Beaver Lake to search & locate large schools of active fish so we can provide you, our clients, with the best possible chance to catch the trophy of a lifetime! giants of 40 & 43 lbs. Visit our Rates & Reservations page to get current rates and scheduling information. We may be adding your picture to the Trophy Photo Album! Be sure to visit our Guide Comments page for information regarding your trip of a lifetime! 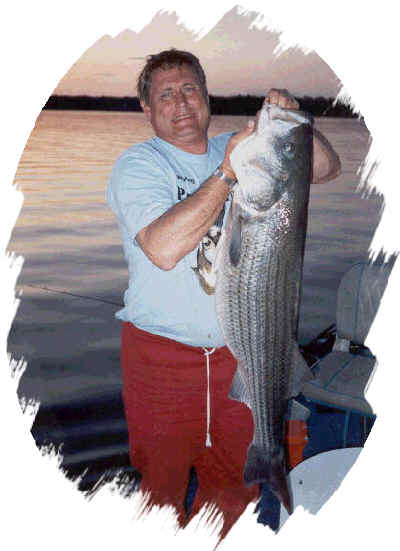 For information about the trophy producing Beaver Lake, the beautiful Ozarks, or other areas of interest, we invite you to choose from a list of sites on our Interesting Links page. under the strain of this 38 lb. Striper!